One of the great hurdles in relationships, is that your partner assumes that you will understand what he/she is thinking. This might be true when couples are together for 20+ years. In new relationships, this assumption and/or expectation will often be wrong, and is likely to cause disappointments between romantic partners. Steven Pinker, Professor of Psychology at Harvard University, calls this phenomenon the Curse of Knowledge. "This cognitive bias basically means that "when you know something, it's extraordinarily difficult to know what it's like not to know it. Your own knowledge seems so obvious that you're apt to think that everyone else knows it, too." Note: italic marking by CNBC. The Curse of Knowledge causes additional problems. CNBC: "The problem with that, he says, is that you're more likely to use jargon that most people don't understand, to skip steps and explanations, and to rely on abstractions instead of describing things in concrete terms." Examples of this "Curse of Knowledge" may be found in journalism, management, philosophy, politics, relationships, religion and science. 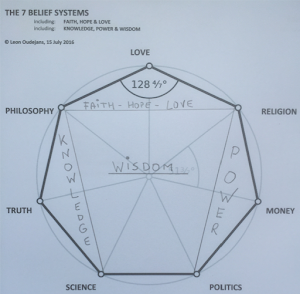 This equals the 7 Belief systems, being: Love, Money, Philosophy, Politics, Religion, Science and the Truth. I think, feel and believe there is an opposite pattern between the private and the professional Curse of Knowledge, and its use by men and women. In general, the Curse of Knowledge is used by men in professional settings, and by women in private settings. However, be aware that this Curse of Knowledge might be nothing more than sheer bluff. A 2016 study ("To Bluff like a Man or Fold like a Girl?" – Gender Biased Deceptive Behavior in Online Poker) indeed confirmed gender bias in the use of bluff. Also see August 2000 Independent article. In other words, men typically use bluff as a professional tactic to hide ignorance by displaying arrogance (my blogs of 2016, 2017 #1, 2017 #2). In a professional setting, women typically assume that men know what women and men are talking about. However, the assumption is the mother of all mistakes (my 2015 blog). This female assumption may even help explain the "gender gap" in careers and remuneration. In private, women use bluff by "constantly gauging and testing a man’s strength" (source, video). In biology, female bluffing is "when a female animal behaves in a way that is intended to discourage a potential predator from attacking her young" (source). The best response to bluff and/or the Curse of Knowledge is simply by asking: "Why??" Also see my related 2017 blog: The fear and love for asking Why. The more people use "jargon, skip steps and explanations, and rely on abstractions", the more likely it is that they do not know what they are talking about. People who understand things, prefer explaining in layman's terms. "The hardest tumble a man can make is to fall over his own bluff." A quote by Ambrose Bierce.